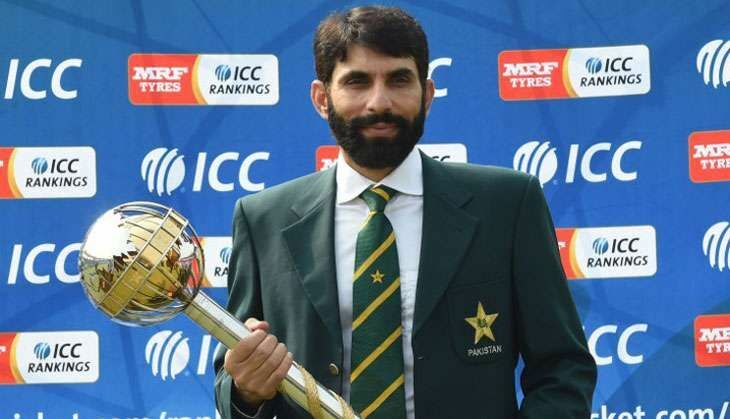 Pakistan captain Misbah-ul-Haq, on 21 September, received the ICC Test Championship mace for leading the side to the top of the ICC Test Team Rankings for the first time since the current rankings system was introduced in 2003. ICC Chief Executive David Richardson presented the mace to Misbah at the Gaddafi Stadium here and the Pakistan Test skipper said it was befitting that the mace presentation was taking place there. "There can't be a better location to receive the ICC Test Championship mace than this ground where we last played a home Test seven years ago," said Misbah. "It is ironic for both the players as well as the fans that the journey to the number-one position has been outside Pakistan. The players have missed on the crowd support, while the spectators have been unable to watch live some magnificent team and individual performances. But I am confident that things will change and international cricket will soon return to Pakistan," he added. Pakistan are only the fifth side after Australia, England, India and South Africa to top the ICC Test rankings, while Misbah is the ninth captain to lift the mace after Steve Waugh, Ricky Ponting, Michael Clarke, Steve Smith (all Australia), Mahendra Singh Dhoni (India), Andrew Strauss (England), Graeme Smith and Hashim Amla (both South Africa). Delighted to hold the mace in the twilight of his career, Misbah said: "It has always been a dream to lift an ICC trophy as captain. To be only the ninth international captain to achieve this honour in the traditional format of the game is something to be very proud of. This mace is a reward for the efforts and hard work of each and every individual who has been part of this group over the past few years." Richardson congratulated the Pakistan team, saying it was all the more impressive that it had reached the number-one Test ranking despite not being able to play a series at home since March 2009 when terrorists attacked the Sri Lanka cricket team's bus here. "The ICC Test Championship mace is a symbol of excellence and a recognition of a side's outstanding performance in the purest format of the game. Being part of a team that is ranked No.1 in Test cricket is a pinnacle achievement for any cricketer. Pakistan is a deserving recipient of the mace. "I hope that the team continues to go from strength to strength. A strong Pakistan side is good for international cricket," Richardson said. Number two ranked India will host New Zealand in a three-Test series, starting tomorrow, and if they win it, they will move to the top of the table even before Pakistan begin their three-Test series against the West Indies on 13 October.